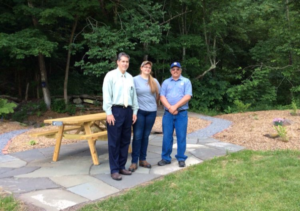 On the first day of summer, ACS Senior Laurynn Weaver stood on the bluestone patio in the center of a garden she had created to dedicate it to the memory of John Hopkins. 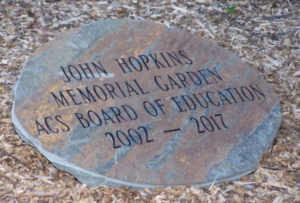 His widow, Meg Hopkins, drew back the shroud to reveal a natural stone inscribed: The John Hopkins Memorial Garden / Member ACS School Board from 2002-2017. 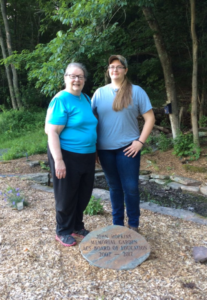 Members of the present School Board, Dr. Chakar, School Superintendent, School Secretary Jan Stevens, Laurynn’s proud parents, Donna and Ken Weaver, and a crowd of neighbors applauded.